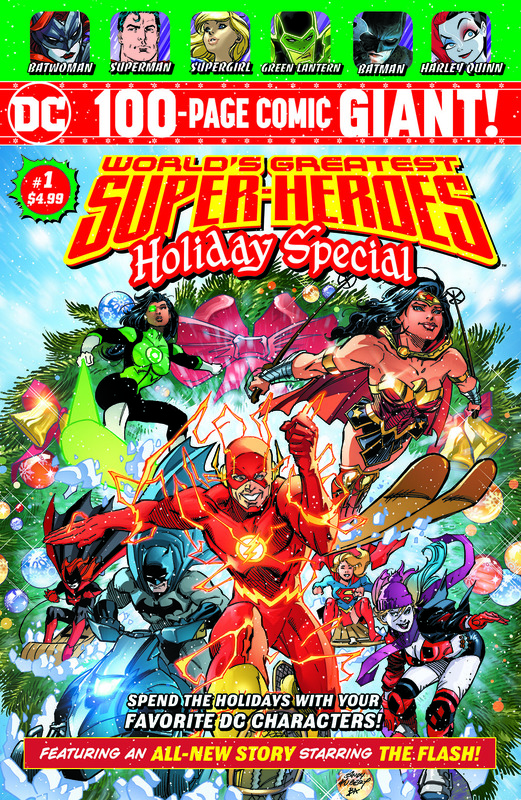 First Look: DC Comics reveals 100 page Walmart exclusive holiday special out this week – AiPT! The giant also includes Tom King and David Finch’s award-winning 2016 story “Good Boy,” Amanda Conner and Jimmy Palmiotti’s 2014 Harley Quinn Holiday Special #1 with art by the late great Darwyn Cooke, and “All I Want for Christmas” from the 2006 DC Infinity Holiday Special written by Joe Kelly with art by Ale Garza. If that isn’t enough, the anthology also features two stories from the 2016 DC REBIRTH HOLIDAY SPECIAL which includes a Batwoman tale by Kate Perkins and Paulo Pantalena and a Green Lanterns tale by Steve Orlando and Vita Ayala, with art by V. Ken Marion. Dan Jurgens and Jackson Guice round out the giant-sized book with the 1992 Superman story “Metropolis Mailbag”. Read all about this upcoming book in stores at Walmart November 11th from the press release below. The fan-favorite creative trio of THE FLASH–Scott Lobdell (writer), Brett Booth (artist) and Norm Rapmund (inker)–have reunited for an original tale featuring the Scarlet Speedster, “Twas the Riot Before Christmas.” Barry Allen’s holiday tradition of giving gifts to the kids at the Central City Home for Wayward Children gets interrupted by a riot at Iron Heights penitentiary featuring some of the Flash’s deadliest foes. In restoring order, he receives help from an unexpected source, but will it be in time to spend Christmas with the kids at the home? Originally featured in the 2014 HARLEY QUINN HOLIDAY SPECIAL #1, “K!llin’ Time,” written by Amanda Conner and Jimmy Palmiotti with art by Darwyn Cooke, shows how Harley Quinn decides to deal with aging and finding her first gray hair–by killing Father Time! Marvel reveals Marvel Rising Action Doll homage variant covers!